To capture this photo, I watched the jenga game until somebody came along to play it. This is a classic example of waiting out the moment, as it's pretty clear what is coming. I saw with him and took cues as to how it was going until finally it started to topple. 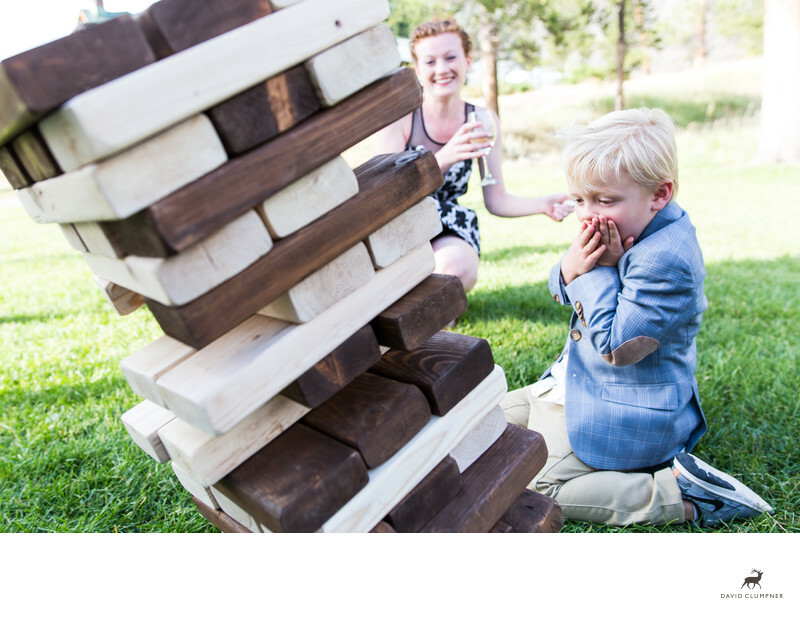 Fortunately for me he reacted shocked while his mom's smile was caught perfectly in the composition as the tower tipped over. Weddings at the 320 Guest Ranch in Big Sky, Montana are a classic Montana wedding experience. The views both north and south down the valley are beautiful mountain vistas. The ranch itself has a herd of horses that run free each evening to cross the road to eat. The Gallatin River flows right through the ranch and there are large pastures all around that are quintessentially Montana. This wedding's reception was on the south end of the property where a tent rests right on the banks of the river and lawn surrounds. So it's a really great location for yard games such as this one. Location: 205 Buffalo Horn Creek Rd, Gallatin Gateway, MT 59730.